A super-comfy winter beanie perfect for added a solid dose of ski style to your day on the slopes or around town, the Stripe Slouch Beanie features a super-soft knit blend of merino wool and acrylic. Outfitted with a relaxed yet stylish fit and a classic striped pattern, this toasty winter hat is sure to warm up any winter day outside. 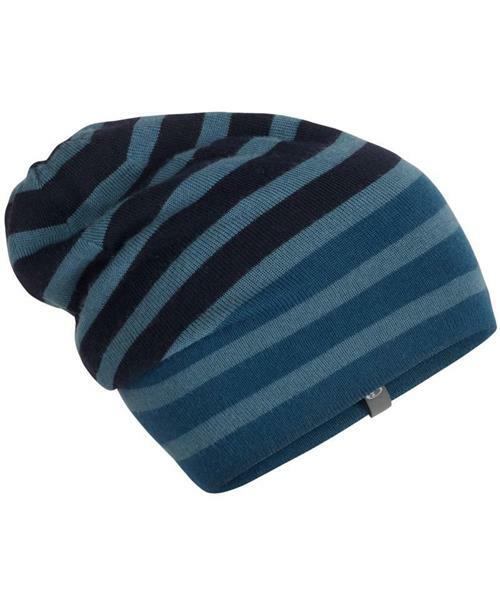 Stripe Slouch Beanie is rated 4.6 out of 5 by 5. Rated 4 out of 5 by Alalib from Always in my pocket I bought this online and when I received it, well it was a bit too tight on my head. I have 3 other hats (other models) from Icebreaker and they all fit perfectly. So i washed it by hand and stretched the wool. Now it’s perfect. This hat is super warm and folds into my pockets. Lightweight for extended backpacking trips. Rated 5 out of 5 by nowitschowtime from Perfect City Slouchy Beanie Perfect slouchy beanie for wearing around. It doesn't slip off my head as quickly as other beanies typically do. It's nice and lightweight but still warm. Rated 4 out of 5 by tinisereniti from Nice but snug Feels and looks nice. Unisex but I'd say more for women as it is rather snug on my head and way too snug on my husband's (who it was purchased for). Rated 5 out of 5 by JFeeney from Comfy and cute! Love this beanie!! Comfortable, warm and cute!! Great for a range of cold conditions. Rated 5 out of 5 by Chan123 from Nice hat Does a good job and looks good, what else to expect?